This tutorial will demonstrate a mold making/casting technique for reproducing plastic handled NZ screwdrivers. An original NZ is used for the pattern; molds are cast from a semi-rigid silicon. 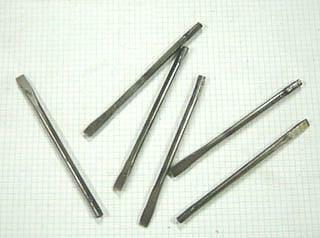 The original NZ's were insert injection molded; that is, a screwdriver shank was placed in the steel mold prior to injecting the plastic, then plastic was "shot" into the mold encapsulating the screwdriver shank. If you look closely at the handle there is a noticeable "parting line" that runs around the perimeter of the handle. This is the split line where the two halves of the mold came together. 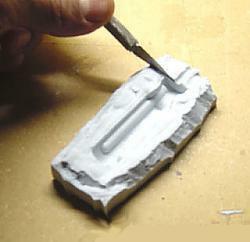 Our technique is similar in that the screwdriver shank is placed in the mold prior to shooting the plastic. In this case, our mold is made from semi-rigid RTV silicon and the plastic is poured into the mold instead of injected under pressure. My guess is Gilbert used acrylic for the handles which would yield about 1 screwdriver per minute per mold. Our setup will yield 1 screwdriver about every 2 hours. Gilbert's molds should have been able to produce over 250,000 shots; ours should handle at least 100 before the mold starts to deteriorate. MEKP liquid catalyst - www.tapplastics.com - $2.55 / 2 oz. Transparent yellow die	- www.tapplastics.com - $3.60 / 1/2 oz. Opaque red die	- www.tapplastics.com - $2.25 / oz. 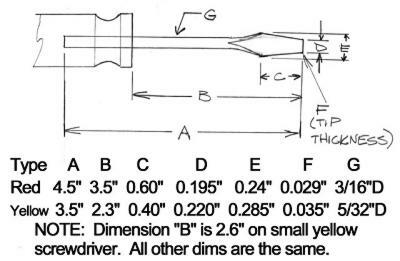 The drill rod is used to fashion the steel screwdriver shanks; 5/32" for the yellow handled variety, 3/16" for the red handled version. Micro Mark and Tap Plastics are the sources I used for the molding supplies; there are others out there. Tap Plastics also sells a Urethane RTV casting kit similar to Micro Mark's. The first step is to make a small box to hold the clay and screwdriver; I used a strip of cardboard approximately 2 inches wide. 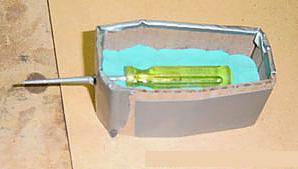 Punch the screwdriver shank through the end of the box and fill the bottom half with the modeling clay. 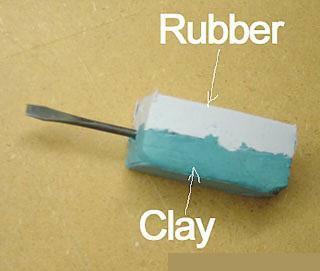 Place the screwdriver in the box and build the clay up to the original "parting line". 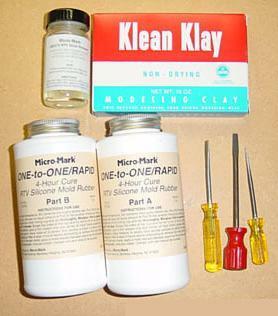 The clay essentially becomes one half of the mold up to the original parting line. Note that the "Erector" molded into the handle will be straight up (on the yellow handled NZ's). 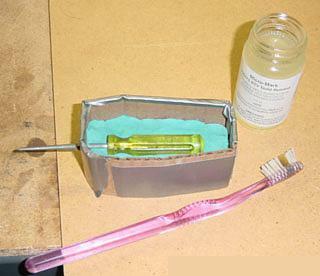 Next, brush on a coat of mold release over the exposed top half of the screwdriver, the clay and the inside of the box. This will prevent the molding compound from sticking to the screwdriver, clay and box. Now pour equal amounts of the silicon mold material in separate cups (per the manufacturer's instructions), and slowly mix the two parts in a third cup. 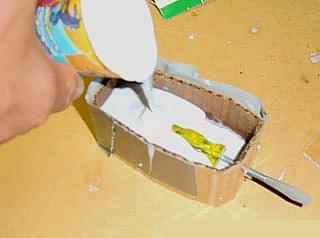 Care must be taken to slowly mix the mold material so you don't get air bubbles in the mold. Bubbles will show up as "pimples" on the finished handles. Micro Mark's product cures in about 4 hours. After the first half of the mold cures, peel the box (cope/drag for you metal casters out there) off the mold. Here's what the first half of the mold looks like. Next, cut some chamfers on the outside edges of the rubber mold. This will help the two halves of the mold locate better together. Otherwise, we'll end up with an offset in the two halves of the handle. 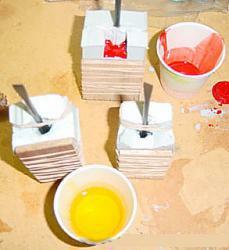 Another method is to make a number of "cone" cuts down into the mold. When cast, the second half of the mold will fill the chamfers/cones. 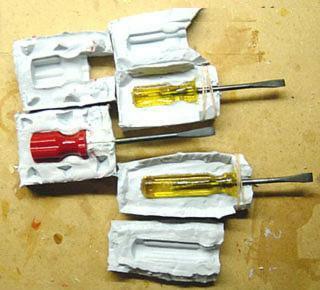 Now, place the screwdriver in the first mold half and place them back into a mold box. 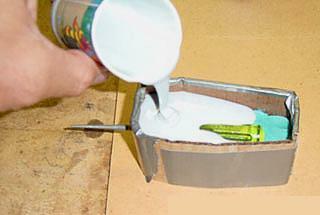 Repeat the application of mold release to the mold, screwdriver and box. Repeat the mold material mixing/pouring to make the second half of the mold. After the second half of the mold cures, remove it from the mold box and split the two halves open. 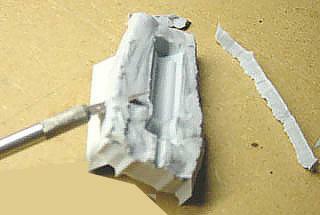 The last step of making the mold is to create an inlet/outlet for the casting plastic/air in the mold. 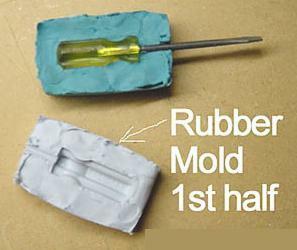 When plastic is injected in a mold, the air volume inside the mold must be given a place to go; trapped air in the mold will show up as bubbles and pits on the handle surface. Since we are using a plastic that will take 15 - 60 minutes to cure (depending on the ratio of hardener to resin), we can get away with a common inlet/outlet (sprue/vents). 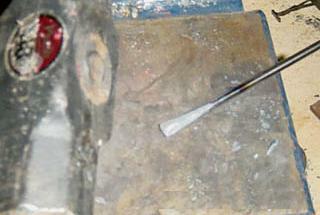 In this case, simply cut one half of the mold off at the base of the screwdriver shank. This is where the polyester resin will be poured in and the air bubbles will escape. Now, on to the screwdriver shank itself. 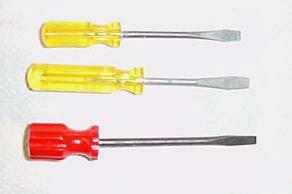 The red handled version used a 3/16" shaft; the two yellow handled ones used 5/32" shafts. I used drill rod from a tool supply store at a cost of $0.10 each for the 5/32" shanks and $0.13 each for the 3/16" variety. A cheaper alternative for the 5/32" ones is 12" axles from Wagners for $0.05 each; good for (3) shanks. Anyway, here's a sketch of the two different screwdriver shanks (the two sizes of yellow handles use the same shank). 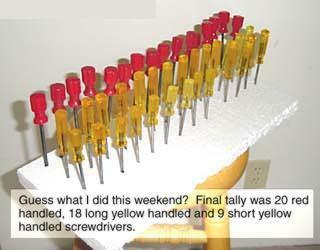 These are the measurements I took on the one red handled screwdriver I have and two each yellow versions. Frankly, I did not try to faithfully duplicate the exact dimensions. In particular, I made the tip thickness a little smaller so the screwdrivers could be used on P13 gears. 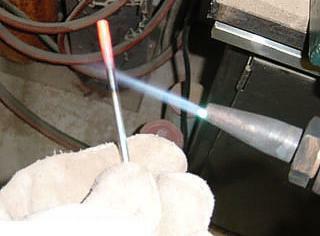 I use an oxy-acetylene torch to heat the shaft red hot and form the blade by striking the red hot steel with a 3 lbs. hammer on an anvil. I flipped the shaft over and struck both sides; about 5 times a side was all that was required. A couple of alternate methods are a propane torch (takes longer to heat the steel) or cold form the blade without heat (requires more hammering). Next, grind the blade profile on a bench grinder. I found it easiest to first grind the tip square to the shaft, then grind both faces. Lastly, grind the sides of the tip. I cleaned up the surface with a wire wheel. The shank imbedded in the handle has a couple of "pinched" areas on either side so the shaft does not turn inside the handle. 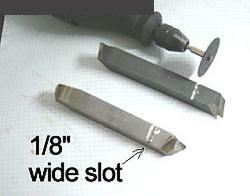 I made a simple die by grinding a slot about 1/8" wide in two pieces of 1/2" square tool steel. 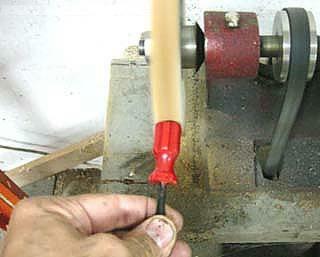 Cut the screwdriver shank to length and heat the end opposite the blade red hot. 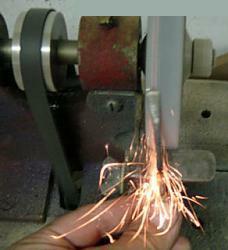 While still hot, place the shank end in the notch of one of the "pinch" dies. Place the other piece of tool steel on top and tap with a hammer. If the steel is red hot, it requires only 4 or 5 strikes to flatten the steel when striking with about the force needed to drive a nail for hanging a picture. Is it necessary to harden and temper the blades? I did but that's a step that can probably be skipped. I cleaned up the screwdriver with a wire wheel as a last step. Note: the red handled screwdrivers had a black finish; Hoppe's gun blue works great for this. Just wipe the product on with a rag and the clean steel turns black. The first step of the molding process is to apply mold release to both halves of our mold. Next, set the screwdriver blank in the half of the mold not cut away at the top and hold it in place with a rubber band. 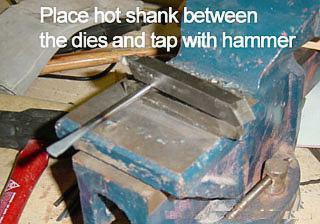 Take care to ensure the shank is in the center of the mold; shim as required with a toothpick or two. I wrapped a piece of masking tape on the shank to mark where it should be positioned in/out of the mold for the correct overall length. 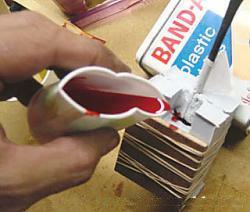 Now, secure the two mold halves together by carefully lining up the two halves and tie them together with rubber bands. I cut two pieces of 1/4" plywood and placed a piece on either side of the mold prior to rubber banding the mold together. This helps the mold from bulging out in the middle which produces an oval handled screwdriver (I made 6-8 of these before using the plywood). Mix the resin and tint together in a clean cup to the desired color. I used paper dixie cups and popsicle sticks. Now mix in the hardener (amount per manufacturer's instructions) being careful while mixing not to create a lot of air bubbles. Carefully and slowly pour the resin into the mold. If you pour slowly, air won't get trapped in the mold and will escape out the top as you pour. Pouring quickly can trap air and cause air bubbles in the handle. With the Tap Plastics polyester, I used two drops of transparent yellow die and 15 drops of hardener per ounce of resin. I used a dab of opaque red pigment about a third the size of a pea per ounce for the red handles. Too much hardener can cause a poor surface finish; too little hardener and you may wait days before demolding. With the hardener/resin ratio I used, the polyester got stiff in about 15 minutes. I waited 2 hours before demolding the screwdrivers. At this point, the polyester was still soft making it the ideal time to trim the base of the handle flush (where the plastic is poured into the mold) with an X-acto knife. Depending on air temperature, humidity, etc., it may take 24 hours or more for the handle to dry rock hard. 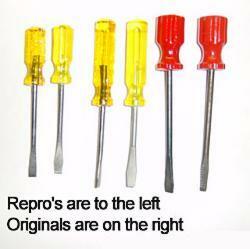 If your screwdriver handles have "flash" on them (thin "fin" of material at the parting line), don't worry. Polyester sands and buffs well. The amount of flash is an indication of possible wear at the parting line of the mold or possibly too few rubber bands (or wrapped too loose) around the mold prior to casting. 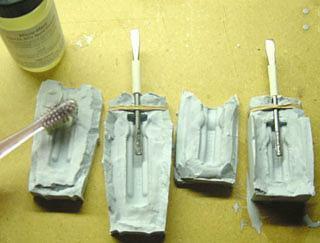 Here's the moment of truth; three screwdrivers fresh out of the molds! Mine had some flash on the handles at the parting line. After they dried rock hard, I sanded the edges with 220 grit sandpaper and buffed them smooth. Here's the final result and the originals. How well did they turn out? Pretty darn good! My yield of "premium" handles was about 50%; excellent reproduction of the raised "Erector" (yellow handles) or "Corsair USA" (red handles), smooth surface with the shank centered and straight in the handle. My useable scrap had some "worm tracks" on the surface I was too lazy to sand/buff out and/or the screwdriver shank was tipped in the handle. I clean the molds after every casting with lacquer thinner on a paper towel. Depending on how close you guess the "shot size", a quart of polyester resin should be good for around 50 screwdrivers. Wagner and Sons does not advertise them, but Mike does occasionally have NZ screwdrivers available. Joel Perlin is another good source. Using an original screwdriver as the mold pattern in no way harms the NZ. 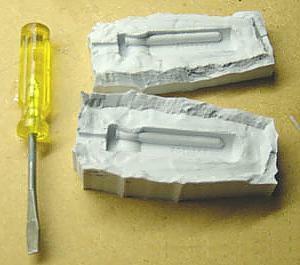 If a mold breaks, simply cast another half or matched set. As an aside, a more realistic treatment of the yellow handled screwdrivers would be nickel plating the shanks prior to casting. That would leave them bright and shiny.